In 1774, strange occurrences began popping up throughout Germany. First, young men began dressing, en masse, in a very peculiar manner. Like a uniform, thousands of youths started to sport yellow trousers, a matching waistcoat, and a blue jacket, complete with dark boots. But then the eerie but relatively harmless phenomena took a disturbing turn: a rash of suicides followed, with each of the victims sporting this very same uniform—and all holding the same pistol. Germany, it turned out, was dealing with some of the very first instances of copycat suicide. But what was driving these young, finely dressed men to despair? A book, that’s what. In the ages before boybands, self-made Youtube stars, and Youtube shows about making boybands, people in the 18th century mostly had to occupy themselves with, ugh, books. So when you just had to get your angst on? Books. When you needed to pour all your horny teenage desires into a fictional version of yourself? Still books. And in 1774, Johann Wolfgang Von Goethe (say that three times fast) became an overnight sensation when he published history’s horniest, angstiest book featuring people who still wore waistcoats: The Sorrows of Young Werther. You see, before there was Bieber Fever, there was Werther Fever. 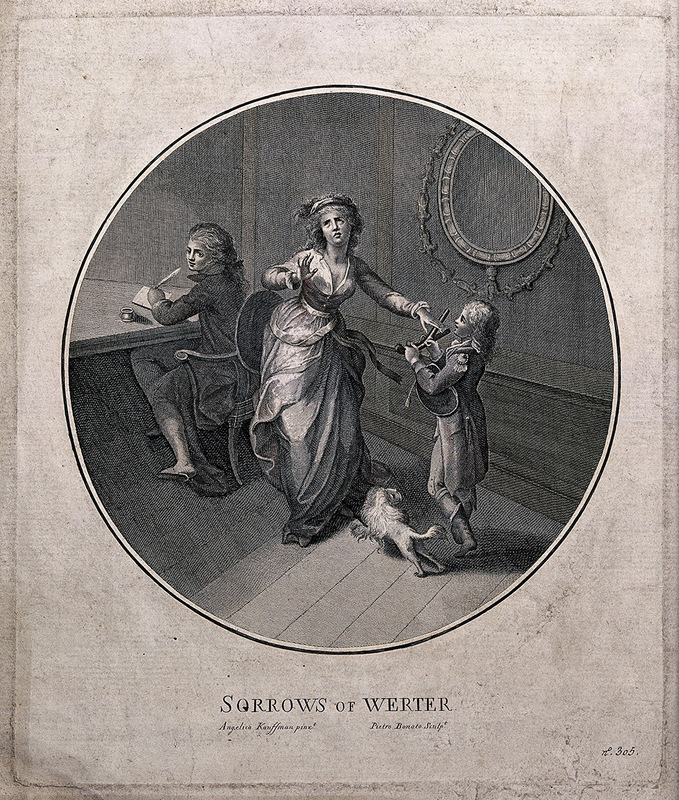 Line engraving depicting a scene from The Sorrows of Young Werther. In the book, the titular Werther is a sensitive artiste who wears yellow trousers and falls hopelessly in love with the virtuous, beautiful Charlotte. Alas, Lotte is engaged to another man named Albert, so instead, young Werther decides to strike up a platonic relationship with her as a consolation prize. That’s right, your boy just friend-zoned the heck out of himself. It doesn’t end well: Charlotte eventually marries Albert, and Werther, convinced someone has to be eliminated from his totally unnecessary love triangle, kills himself with a pistol. Thus, the copycat suicide was born. Young men of the period resonated with Werther’s alienation from society, his outpouring emotions, and his individualism; Goethe once said, “It must be bad, if not everybody was to have a time in his life, when he felt as though Werther had been written exclusively for him.” Goethe became the toast of the town, Napoleon Bonaparte himself was a Werther fan, and a deluge of Werther-related prints, porcelain, and perfume were manufactured to cash in on the fever. But as the copycat suicides hint at, there was a dark underbelly to the mania: young men also resonated with Werther’s final, dramatic act of violence. The Sorrows of Young Werther is an elegy for the bittersweet follies of youth, but the cultural response to the novel belies an 18th-century masculine disenfranchisement that has echoes in today’s cultural climate. Five cups with scenes from The Sorrows of Young Werther, made by Konigliche Porzellanmanufaktur, Berlin, 1847-1849. But the novel and its tragic fallout also bring up another contemporary, related debate: how much does life imitate art? To put it in 21st-century terms: do video games incite violence? Do slasher flicks make serial killers? Did Werther wreck these men? Art is influential; when we read or watch it, we feel deeply, and maybe we get ideas. Famed wit Oscar Wilde made the case that, “Life imitates art far more than Art imitates life. A great artist invents a type, and Life tries to copy it, to reproduce it in a popular form.” In this view, Werther made these young men and then unleashed their tragic deaths onto the world, like a doomed assembly line of little real-life Werthers. Thanks a lot, bud. But however darkly romantic this image is, it seems more likely that these men were looking for an outlet for existing grievances, something to give their woes shape. Art can’t be created out of nothing—and, more importantly, fiction can’t fully encompass us: we are living, breathing, growing, and changing. When I read Catcher in the Rye for the first time, I wanted to be Holden Caulfield. Now? You couldn’t pay me to date him. We change, we grow beyond the books we read and the films we watch; they shape us but they do not make us. In following Werther’s plot right up until his end, the youths robbed themselves of the privilege to go past him. No matter how many times you re-read The Sorrows of Young Werther, he always ends up dead. These boys shared the same fate as Werther, but they once had other options. In fact, in a truly impressive case of 18th-century fanfiction, Friedrich Nicolai decided to exercise these options. Not super into Goethe’s original climax, Nicolai totally rewrote The Sorrows of Young Werther as a satirical text with a happy ending. He called it The Joys of Young Werther, naturally, and in it Werther is tricked into avoiding his suicide, eventually gets the girl, and overcomes his youthful disenfranchisement to reintegrate into society. 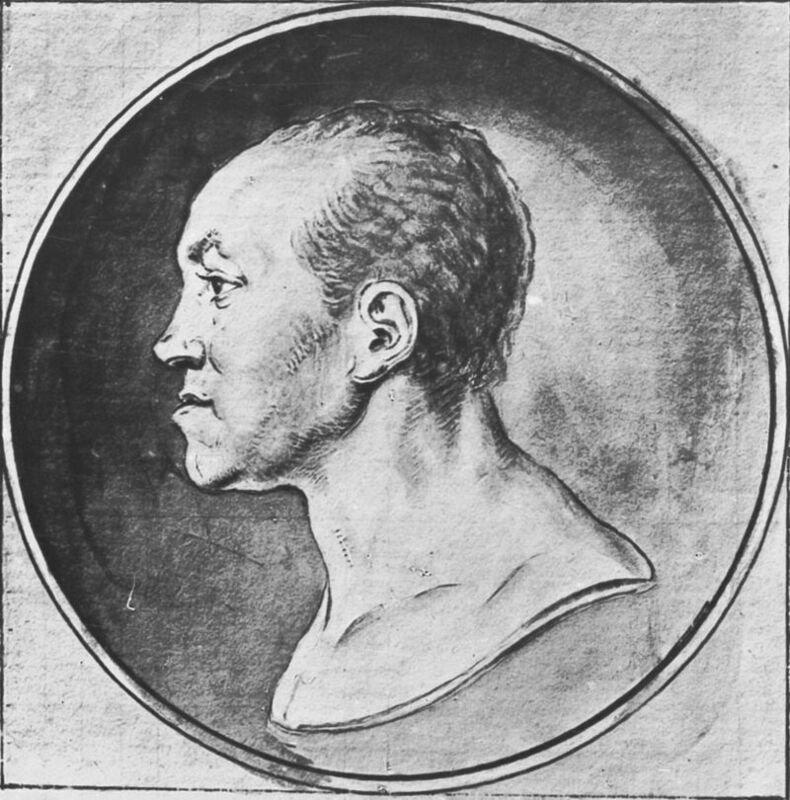 Does Nicolai’s work completely override the subversive elements of Goethe’s novel? Oh, for sure. But it also imagines a world outside the text, and proves that literature need not be taken as gospel, especially for our lives. If you need any more proof that The Sorrows of Young Werther is more than just a revered handbook for 18th-century nice guys, get a load of this: Goethe was pissed off at Nicolai for the liberties he took with Werther, and clapped back with the poem “Nicolai on Werther’s Grave.” In it, a simple passerby (a thinly veiled Nicolai) ends up defecating on Werther’s grave. Wait, what? That’s right, Goethe rails against Nicolai for disrespecting his novel… by gifting everyone with the image of someone plopping a nice, thick number two on Werther’s final resting place. The jury’s still out on how much dignity that actually gave back to the novel. But what I’m really trying to illustrate for you here—besides the image of a MAN POOPING ON A GRAVE—is that we have lives beyond texts, and even these texts can have lives beyond themselves. In short, fiction is powerful and moving, but its endings need not be our ends. The Sorrows of Young Werther itself went on to influence the burgeoning Romantic movement of the 19th century; Goethe went on to write more novels (though he continued his feud with Nicolai until his death); and many years later, kindred characters like Holden Caulfield and Madame Bovary were created. Tragically, the victims of Germany’s 18th-century copycat suicides never found out an essential truth: we can read other books, and we can become other people.